Anyer is an attraction located 160 km west of Jakarta (the capital State of Indonesia). 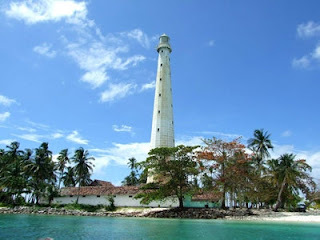 It’s attractions especially located in Banten, can be reached only two hours from Jakarta. Various attractions can be found in Anyer like water sports, relaxation & spa, boat to Sanghyang Island, even picnic to Mount Krakatoa. An ideal vacation spot, relax on the sunny beach, even enjoying the ocean visible from the inn. Anyer (also Anjer) is a town in Banten, formerly West Java, Indonesia, fifteen kilometres south of Merak. It is home of a forty metre lighthouse built by King Willem III of the Netherlands in 1885 as a memorial for the townspeople killed by the eruption of Krakatau, which destroyed the town. It is also the starting point of the Great Post Road, built by the Dutch in the nineteenth century, which ran 1,000 kilometres to the eastern tip of Java. Off the coast of Anyer is the island Pulau Sangeang, an uninhabited island with vast areas of untouched jungle. The area is also known for coral formations swarming with tropical fish. Anyer Beach is a tourist attraction with hot swimming water, a hotel and rental of resting sheds, boats, four-wheeled motorcycles, water scooter and a banana boat. For you who like a challenge and fun, available jet-sky or banana boat can be rented near Anyer. You also can rent a boat for fishing, seeing beauty sunset or seeing the Krakatoa which looked out lava. Rental boats also can be made to go to the Sanghyang Island not far from Anyer, Mount Krakatoa, Legondi, and Ujung Kulon. Foreign tourists usually love the adventure to Mount Krakatoa. Picnic to the Sanghyang Island is a pleasant experience, because it is island still virgin and clean. The Beautiful beaches at Sanghyang Island provide an unforgettable experience.